Google recently rolled out a big update to Wear OS with improvements including a new streamlined UI, better health and fitness tracking, and an all-around smarter and more useful Google Assistant. But as nice as that all sounds, software is just one piece of what you need to make a good smartwatch, because without the right silicon powering the device, gadget makers can only do so much. 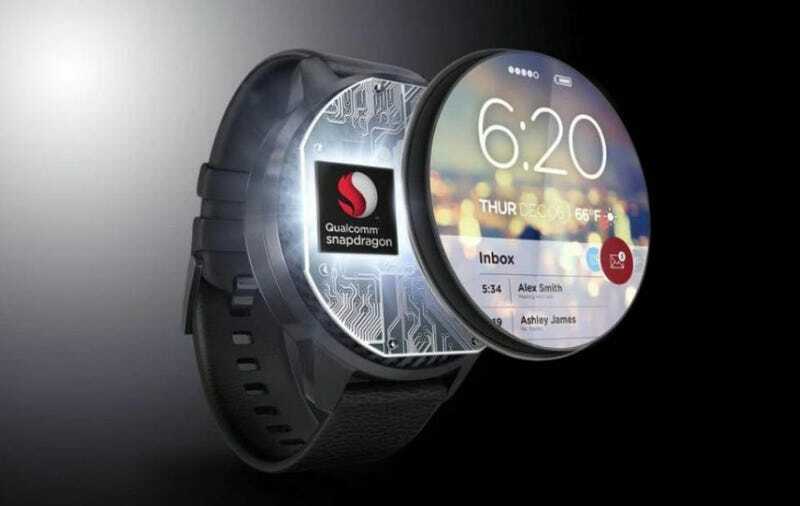 And unlike the Apple Watch, which has gotten a new homegrown S-series processor every year, with Qualcomm responsible for 80 percent of the chips in Wear OS (formerly Android Wear) devices, the best most Wear OS makers could do has been the Qualcomm Snapdragon Wear 2100 which have been around since February 2016 (and that’s not even considering the even more dated Snapdragon 400 chipset SD Wear 2100 is based on). Thankfully, that could be changing today with the announcement of Qualcomm’s new Snapdragon Wear 3100 platform. Instead of shrinking down chips intended for phones and cramming them in wearables like with SD Wear 2100, SD Wear 3100 chips are purpose-built smartwatch SoCs (system-on-a-chip) with four A7 CPUs (instead of just one on the SD Wear 2100) for increased performance, and new DSP, and ultra low-power co-processor for increased energy efficiency. When you translate those efficiency gains into real-world battery life, the effect on new Wear OS devices could be quite significant with Qualcomm claiming Snapdragon Wear 3100 offers 4 to 12 hours of additional active use when compared to Snapdragon Wear 2100, with total battery life increasing by as much as 1.5 to 2.5 days (depending on the size of the battery, of course). Qualcomm is even using that new ultra low-power co-processor to make a new energy-sipping Watch Mode, so that when the device’s battery gets low, you’ll still at least be able to tell the time. And to help support services like Android Pay, Snapdragon Wear 3100 also includes more tightly integrated NFC, while better 4G connectivity should make it easier for watch makers to create standalone devices that don’t need to be constantly tethered to a smartphone. There’s even redesigned integrated sensor hub to help facilitate things like all-day heart rate monitoring and other fitness data gathering. In another interesting twist, Qualcomm says Snapdragon Wear 3100's new co-processor now takes 20 times less power to animate a watch’s second hand, which many digital watch faces previously omitted because they sucked up too much juice. There’s a lot more fashion brands than tech brands in the Wear OS game nowadays, which is both good and bad. Unfortunately, the new chip means many recently announced smartwatches may be outdated before they even go on sale. However, with an updated platform to work with, Snapdragon Wear 3100 may herald the return of more core tech companies to the smartwatch space. This is important because in the last couple years, most new entries into Wear OS smartwatches were made by fashion brands like Fossil and others, which is nice if you were looking for notification and step-tracking support from an otherwise normal(ish)-looking watch. But at the same time, those fashion brands weren’t really doing much to push the category forward in terms of new features and capabilities. But with Snapdragon Wear 3100, hopefully both gadget nerds and the more fashion conscious can find a happy balance. That said, until an actual watch sporting a new SD Wear 3100 gets released, it’s still on smartwatch makers to make that happen. Update: Montblanc has announced that the Summit 2 will be the first smartwatch featuring Snapdragon Wear 3100. It should arrive sometime in October, and if the original Summit is any indication, it’ll probably cost around $900.